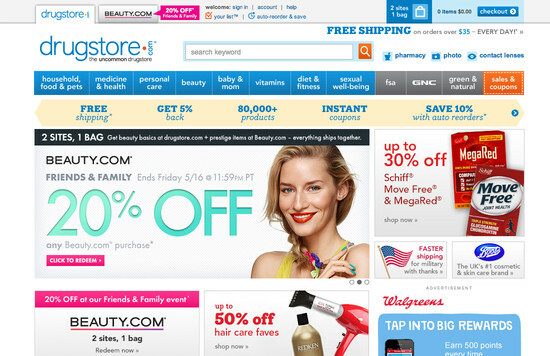 drugstore.com’s On-Site Search performance is poor. 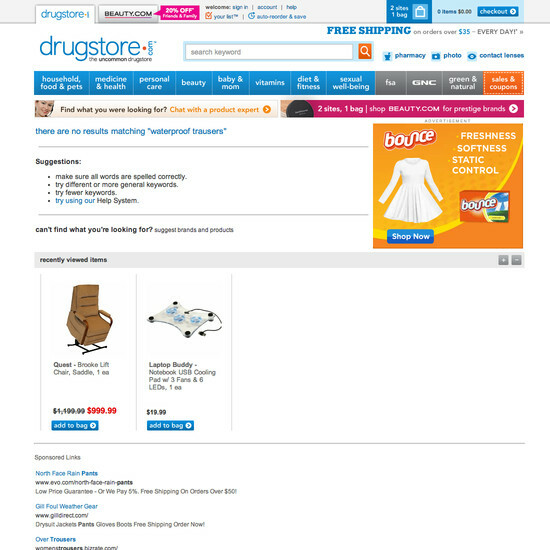 drugstore.com’s search experience is particularly thwarted by usability issues related to mediocre Results Logic & Guidance and broken Search Form & Logic. 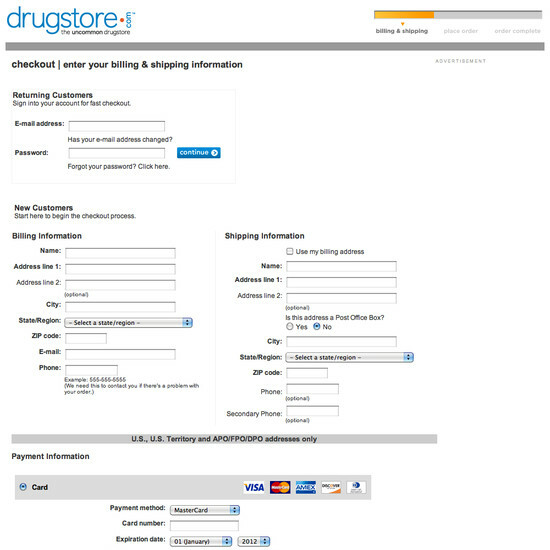 drugstore.com’s Cart & Checkout performance is mediocre. 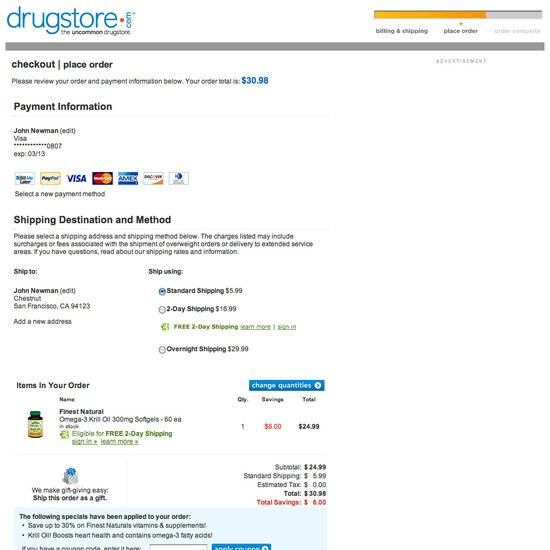 Some of drugstore.com’s biggest checkout usability issues are due to poor Flow, broken Layout, and broken Focus. 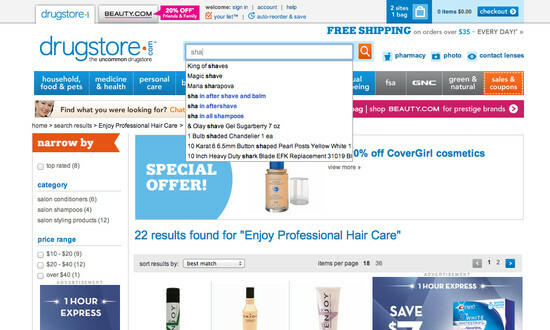 That said, their checkout performs great within Copywriting. 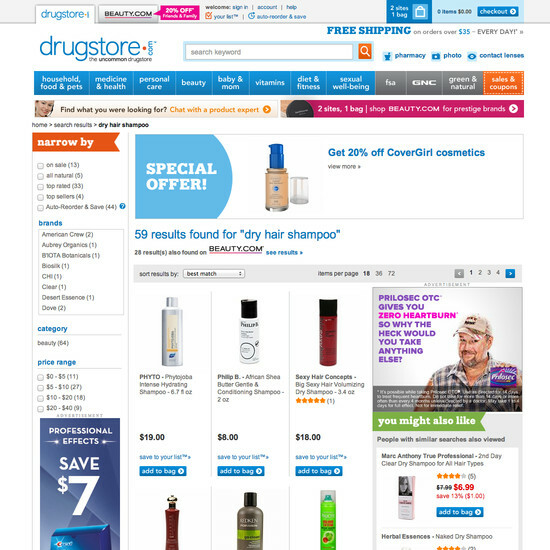 Premium also shows you why drugstore.com and 59 other top e-commerce sites perform as they do, and allow you to self-audit your own sites to see how your UX performance stacks up against theirs — learn more. These 15 ‘Data Input’ guidelines are only available in Baymard Premium — they are based on our large-scale Checkout Process UX research study, and outline the 15 elements necessary to create a high-performing ‘Data Input’ implementation. These 8 ‘Copywriting’ guidelines are only available in Baymard Premium — they are based on our large-scale Checkout Process UX research study, and outline the 8 elements necessary to create a high-performing ‘Copywriting’ implementation. These 15 ‘Layout’ guidelines are only available in Baymard Premium — they are based on our large-scale Checkout Process UX research study, and outline the 15 elements necessary to create a high-performing ‘Layout’ implementation. These 8 ‘Navigation’ guidelines are only available in Baymard Premium — they are based on our large-scale Checkout Process UX research study, and outline the 8 elements necessary to create a high-performing ‘Navigation’ implementation. These 7 ‘Flow’ guidelines are only available in Baymard Premium — they are based on our large-scale Checkout Process UX research study, and outline the 7 elements necessary to create a high-performing ‘Flow’ implementation. These 10 ‘Focus’ guidelines are only available in Baymard Premium — they are based on our large-scale Checkout Process UX research study, and outline the 10 elements necessary to create a high-performing ‘Focus’ implementation. All 60 sites were benchmarked across the 610 guidelines. 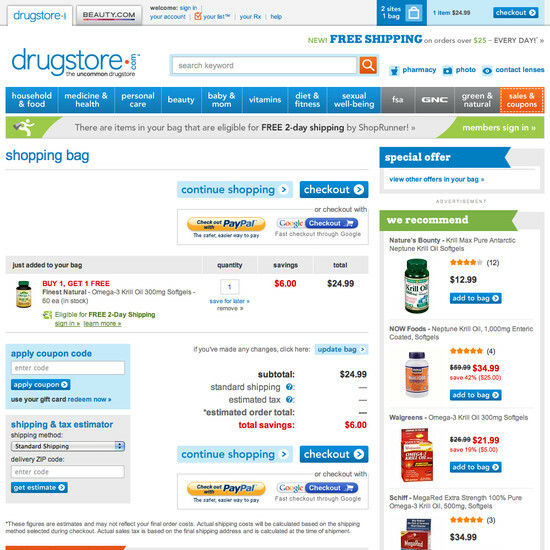 During our evaluation, drugstore.com’s e-commerce site adhered to 342 usability guidelines, violated 213, and scored neutral on 87 occasions, while a remaining 34 guidelines weren’t applicable.